Oolite Arts has announced its two first Cinematic Arts Residents. 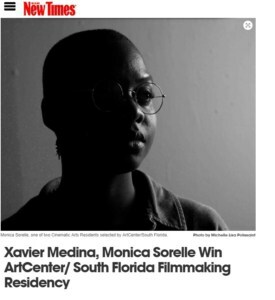 Xavier Medina and Monica Sorelle will each receive $50,000 to produce feature films in the City of Miami. It’s an unprecedented budget for these filmmakers to make independent movies guided by experts with successful careers in the industry. Dennis Scholl, president and CEO of ArtCenter, has produced three documentaries focused on Miami creatives and culture. His latest, The Last Resort, was recently picked up by indie distributor Kino Lorber, and was co-directed by Kareem Tabsch, a successful short documentary filmmaker and co-founder of the franchise of local O Cinema art houses. Tabsch helped conceptualize the grant initiative with Andrew Hevia, co-producer of the Oscar-winning Miami-set film Moonlight by director Barry Jenkins. Both Tabsch and Hevia will guide Sorelle and Medina through the production process. ArtCenter’s Cinematic Arts Manager Jason Fitzroy Jeffers, another notable short film producer and writer who co-founded the Third Horizon Film Festival, runs the program.